Whether you're big NFL fans or you spend Saturdays watching your college alma mater play, every football couple needs this Football Wedding Cake Top. 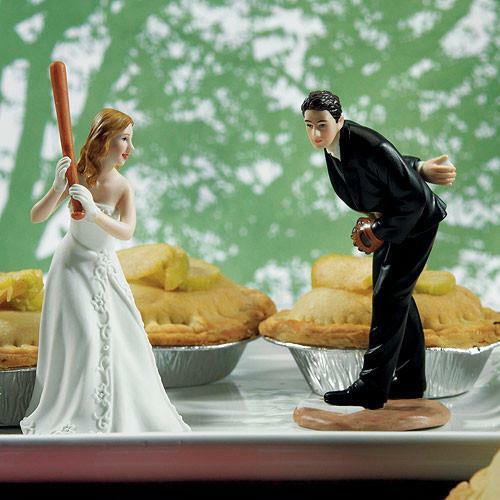 Just make sure there's no tackling going on near the cake table! 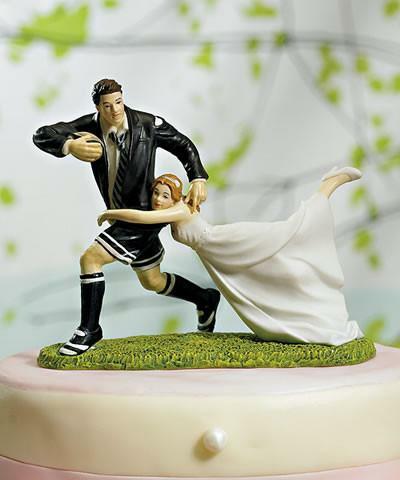 For brides and grooms that are in love with the sport of rugby, as well as each other, we've got this incredible Rugby Couple Figurine Cake Top. The gravity-defying pose shows that this is a couple clearly in the game to win! 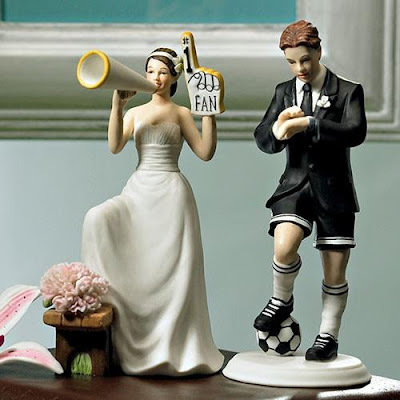 This cheering bride is obviously a big fan, and the groom is ready to get back out on the field! On this very special day, rather than "GOAL," the two of you score by saying "I DO!" and showing off your team spirit with this Soccer Theme Wedding Cake Topper. 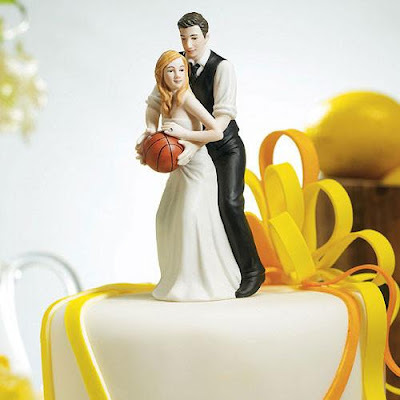 As soon as basketball fans tie the knot, they've begun forming their own "Dream Team", so this "Dream Team" Hoops Wedding Cake Top is a must for them. This cute topper features the wedding couple playing a little one-on-one, which they may do occasionally during marriage, but most of the time it will be lots of teamwork. 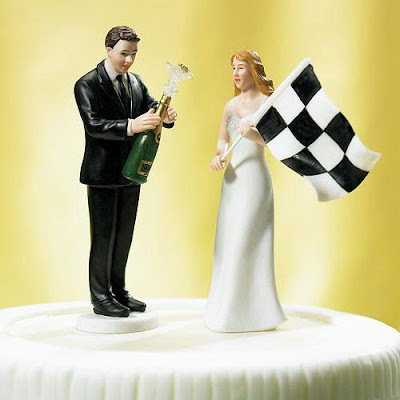 This Racing Fan Wedding Cake Top will look excellent on the top of your cake. After all, isn't "happily ever after" the best finish line of all? Show off your excitement with the jubilant celebration going on in this cake top scene. 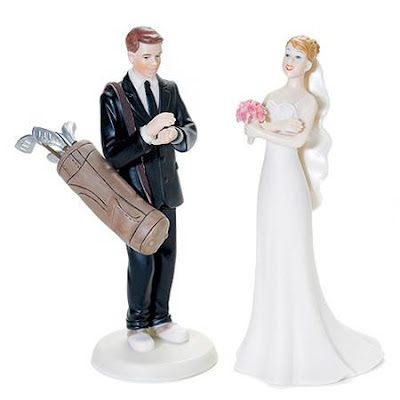 If your fella wishes the reception could be happening directly on the golf course and you were all playing a round instead of dancing the night away, then this Golf Fanatic Groom & Exasperated Bride Wedding Cake Top is for you! We realize that many women also love golf and don't mind getting out on the links too, but this adorable cake top takes a whimsical jab at this hobby. If fishing is a favorite pastime of yours, you're going to love these! We've got two cake tops that use this hobby for a scene that will definitely put a smile on your guests' faces. 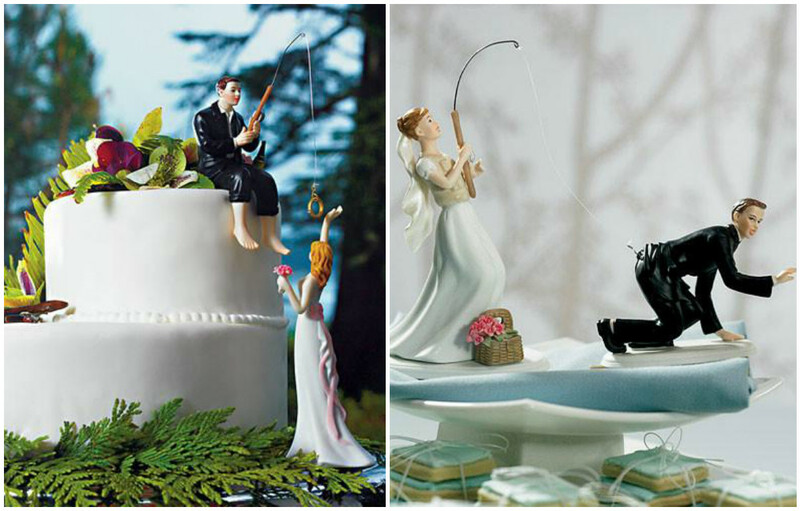 The Gone Fishing Wedding Cake Top has you reeling in the groom, and our Hooked on Love Groom Figurine Cake Top has him catching you instead. 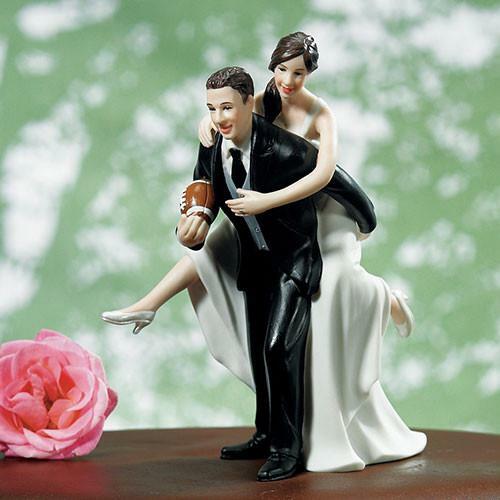 The bride figurine is sold separately to allow you to mix and match the one that you feel represents you the most. This gorgeous topper features a couple who is ready to pedal their way down the road to romance. 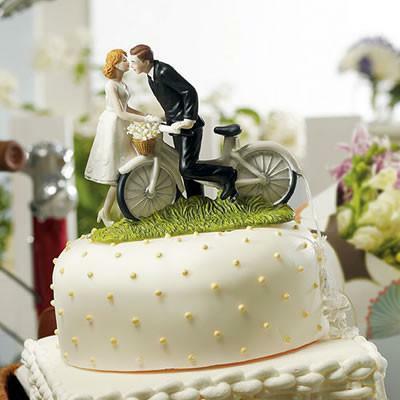 The A Kiss Above - Bicycle Wedding Cake Top is truly romantic and reminiscent of a sweet 50's style. You might consider arriving at the ceremony or leaving the reception on a bicycle built for two! This one works exceptionally well for a winter wedding, but it's just as perfect in the summer if hitting the slopes is your favorite thing to do. 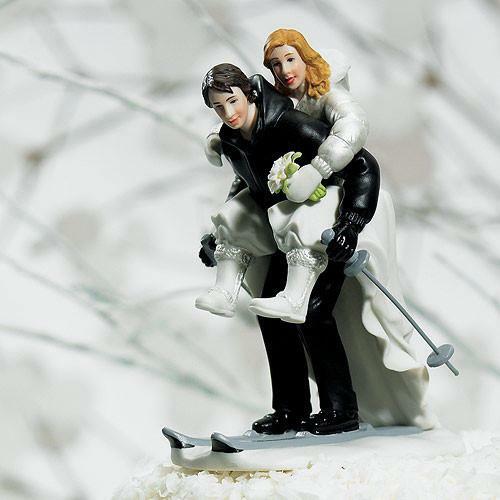 This Snow Skiing Cake Top will make a "cool" statement on your dessert table. Most of the wedding cake tops that you will find at WhereBridesGo.com are customizable so that they can better resemble the two of you, with different hair and skin tones available. These are just a small sampling of the many different styles that we have to offer. Head on over to our wedding decorations online and take a look. There is bound to be something that will capture the two of you beautifully.